today was really rather funny. first you should know, these trees and i are not getting along too well. i'm a sneezing mess but let's not dwell on it. somehow i peeled myself off the couch and pulled on some proper clothes, stuffed my toddler in his stroller, that sort of thing. adventures aren't going to have themselves, you know. and then it was so soupy out. my hair went pfffft and that's when you learn what you're really made of, when the hair you've just carefully brushed into place goes all rogue on you. i blame the weather for this next part, too: stupidly i spent nine dollars this morning on a bottle of green juice from organic avenue. i drank it really fast (while pulling all my most attractive faces, seriously, yuck), and then i suddenly turned into a freaking superhero. holy the what, kale juice! i am telling you i was unstoppable. i went on to have a very you've got mail-y type afternoon. we passed barney greengrass while running errands so we stopped in for a bagel (this is where birdie and kathleen have the discussion about the "book district" and the "vice versa" and also that very crunchy sounding tuna sandwich or whatever that was). 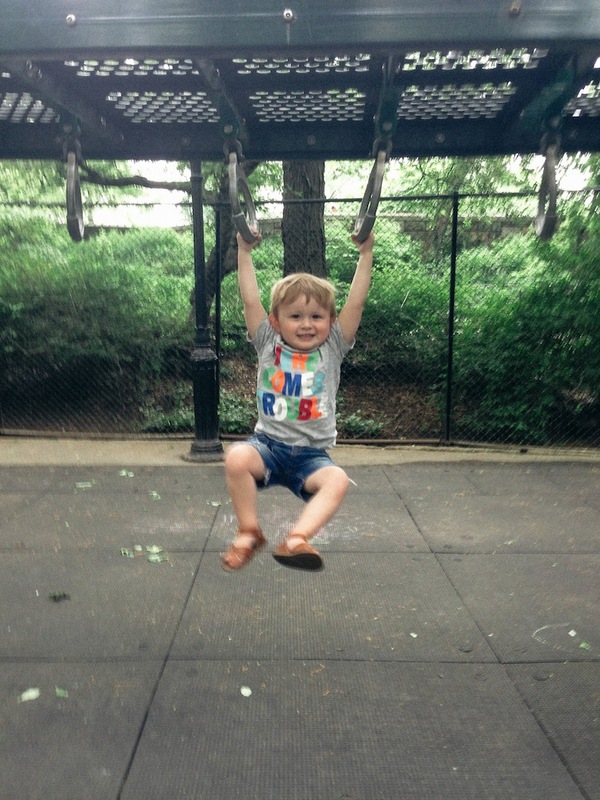 once errands were accomplished we went to riverside park for an afternoon playground date and got to walk past that sweet little flower garden at 91st street. and then by sheer accident we walked down 89th street on our way home. 89th being where they filmed the exterior shots of kathleen's apartment (i am pathetic and/or awesome for knowing this stuff). to make things even nuttier, i remembered on the way home that some of brandon's shirts needed to be picked up from the dry cleaners. and this is where we come full circle, because our dry cleaner dude used to be on columbus avenue but recently moved into the space that used to be cafe sonatina, which before that used to be maya's cheese shop, which before that used to be . . . the shop around the corner. no i am NOT kidding you and that is why i'm willing to walk eight blocks out of my way to still use our old neighborhood dry cleaner dude. sometimes i am such a cliché of myself. but today i was real happy to have them. even in this big old city where it can sometimes feel like it's me against the world, and where i sometimes feel so off my game, i have somehow made these little pockets of "me" here and there. little pockets that remind me that this big place is mine, too. i think it's important to have little pockets like that, where ever we may live. 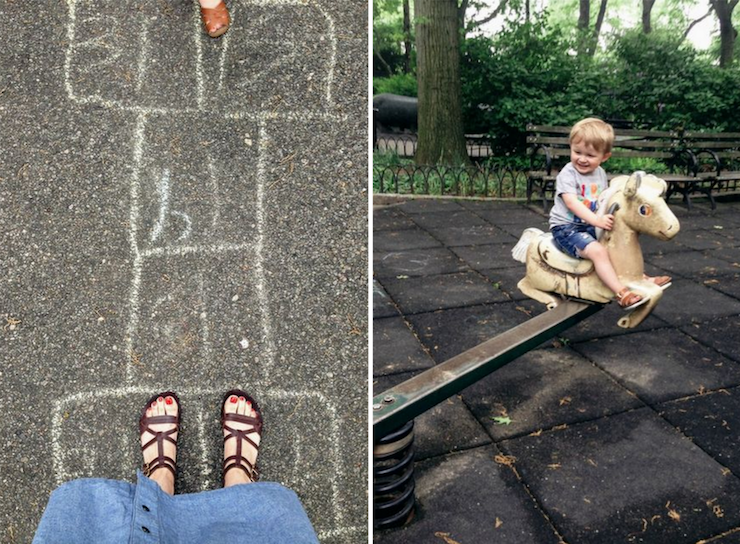 a few photos from our afternoon at the park. my kid is a giant. gosh those flowers are gorgeous! and props to you for braving that awful humidity today... my gosh it felt like a sauna out. I'm not ready for the summer heat yet. I need spring to stick around a little longer please! oh my gosh, you're on at that stoop. what I love about you've got mail is that kathleen kelly has seasonal bedding. a true woman's touch that only nora could provide, you know? love it when days like this happen! feels like a bit of magic... even on these grody east coast days - must have been the kale! So lovely! I adore those lilacs. Also, this may sound insane, but I was watching the Tudors via Netflix last night, as all sleepless Tuesday nights are good for, and (this is where it gets creepy of me)I couldn't help but think Steven Waddington as the Duke of Buckingham looked like he should be your husband's brother! (http://images.buddytv.com/articles/the-tudors/images/steven-waddington.jpg) Am I crazy? Yes? Okay. I'm re-reading "I Feel Bad About My Neck" right now because I was missing Nora the other day. Also; thanks for mentioning the unusually crunchy tuna sandwich bite by Birdie. I always hold my breath and wait for it...because I'm weird. Great post! Ah, I'm sooo jealous of you right now :)! I can't wait to visit New York someday with my husband and baby boy! That just made me wanna be in those pictures, is how it is. I mean, NO DUH, I'm at work and...need I say more? Boom. I win extra points. Looks like a whole afternoon of serendipitous events. Not much excitement happens in my little town in Scotland. I'll have to start looking around corners and such. Maybe I'll finally find myself. Oh I love love love this post! How I miss New York! I shall follow your blog now and forever and visit one of my favourite cities vicariously. nyc in spring is amazing. i love this post, natalie. and those lilacs are just too pretty. we have a dark purple and a white lilac bush/tree in our front yard and they are in full bloom right now. so so pretty. and the smell soooo good. 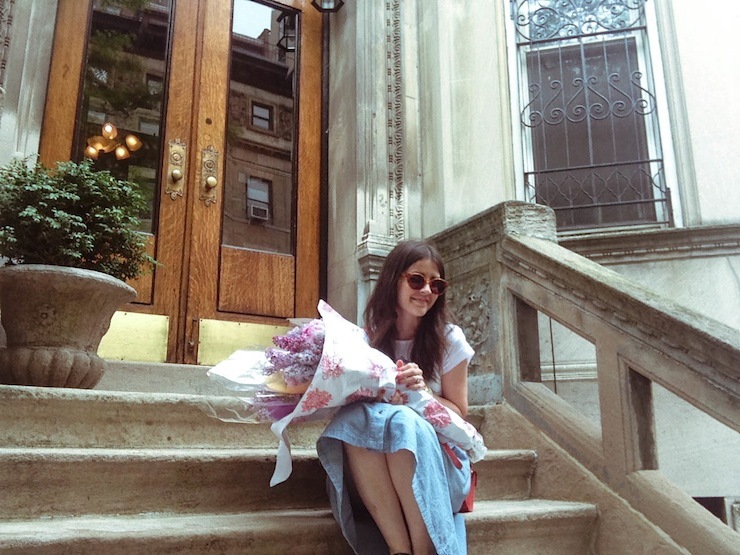 Does anyone even have business reading this blog if they don't recognize that stoop? I mean seriously? I've seen all the great Meg Ryan movies almost too many times now that I have to hide them (the DVDs) from myself so I don't start to hate them. But then I really miss them, so lately I've been watching myself some French Kiss, which I didn't used to like as much as her others, but now I find myself really enjoying it and quoting it in my mind. Although, I don't think Kevin Kline is all that believable as French, but what do I know about the French? You are very right about In The Land of Women though. No thanks. Also, Hanging Up was lame. I want to go and walk around the city and buy flowers now! ps - I like your denim skirt a lot. My mum wore one in the 90s (you're not 'mumsy', dont worry), I just think it's really cool that you wear one and I wonder if Huck will associate them with his mum like I do! Simply adore your writing style! but why didn't you go to the nut shop, where it's fun? hahaha! I love that you called your husband and son Gingers!!! hahahaha! Your son is so adorable!!! Love the flowers as well. We have lilacs in the garden now too. They're sublime! theeeee shop around the corner! wow! how cool! I love when you said "there are these little pockets of "me" that seem to be waiting for me around every corner. little pockets that remind me that i matter. that this big place is mine, too". Love that. And I wasn't one of the ones who knew what stoop you were sitting on! But awesome that it was 'You've Got Mail'! I still haven't seen the whole movie! Have you ever seen 'The Shop Around The Corner'? That's the same story, just an older version of it. It's pretty good. 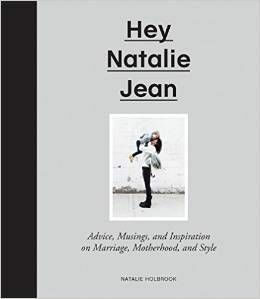 Love your post Natalie!! I'm so glad I've started reading your blog, because I look forward to reading it! ahhh I love that. This whole thing. I need a New York adventure. Will you be my tour guide? Natalie you're just wonderful! Every day you make me laugh. Your blog is just the best. And so is Huck and Mister Holbrook ofcourse. You seem like the sweetest mom out there and you're an inspiration to me (my boy is 1,5 years old) Keep doing what you do. And thanks for doing that. Oh I love your little world and look forward to your posts. And Huck, he really IS a giant! Oh New York and your abundance of flower stands. How I love thee. I just wish I could pull you a bit closer to Texas - who needs the midwest anyway, what has Kentucky ever done for you, I say? I saw your flower post on instagram and I just want to nuzzle my face in those peonies and live there. And I had no idea that self-timer apps existed. And now I want one! New follower here and let me tell you, PERFECT post for me to start reading. I would send you a bouquet of newly sharpened pencils if I knew where you lived. :) "You've got Mail" is one of my absolute favorites. Props, by the way, for downing that kale juice! Kale is downright gnarly. oooh earlier this week i walked past that dry cleaners in a nostalgic romp through my old neighborhood and lamented the fact that it was no longer the cheese shop. those blocks between columbus and amsterdam will always have my heart. something you wrote that is inadvertently a pocket of me - i'm 37 weeks and totally naming my little girl Birdie :D Everyone has asked where i 'got it'....welp, You've Got Mail! this has obviously made me want to watch this as soon as i get home from work! i love magic days. and cliches. oh lilacs. simply the prettiest. You and Kathleen Kelly live a charmed life. 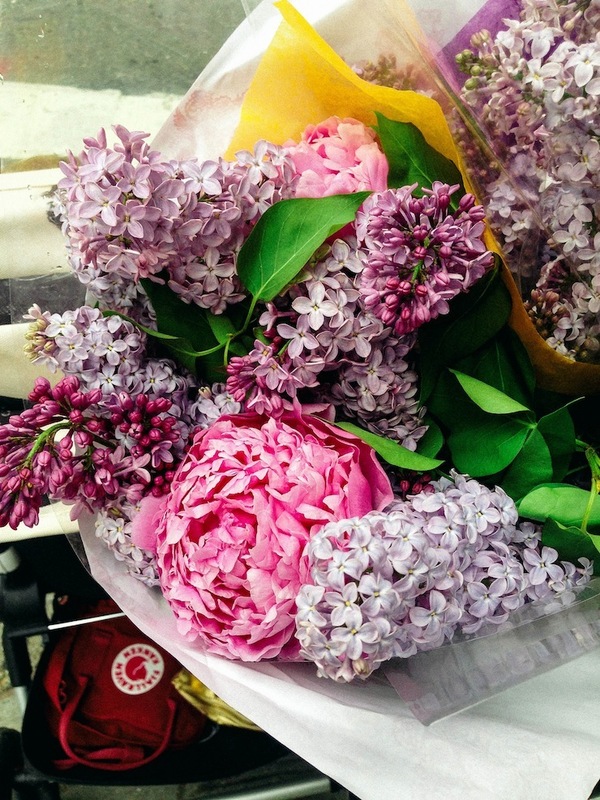 You've Got Mail, lilacs, and peonies - a few of my favorite things. oh natalie! you make me smile. indulging in a day like this is what our little lives are about!!!! thanks! That crunchy sandwich sound turns into the sound of Greg Kinnear pulling whatever out of a brown paper bag. I've always thought it was so clever to use that one sound for both things. I think there's a phrase for that dry cleaner/shop around the corner situation... "practically providential" (Anne of GG, right??) Anyway, what a perfect spring adventure. mmm what an inspirational post. bookmarking it and sending to my own mom. :] thanks so much for your thoughts! I'm loving Huck's shorts and am dying to get a pair for my little one. Where can I find them? ps. LOVE your writing style! that does sound lovely, but i am a little sorry you have to purchase things like lilacs and peonies when they are just sprouting up all over my little mountain town, fresh for the taking. however, there is nowhere to get even a bagel here, so there are trade-offs. I am glad your day turned around. Also: I love your dark brown sandals... details, please?